I submit to you that I cannot afford a brand new 2013 BMW M5. Regrettably so. Of course, I aspire to own one – now more than ever, after spending seven blissful days at the helm of the world’s favorite 4-doored supercar. I’ve driven plenty of supercars, but few get my heart racing like the M5. I don’t know what it is – you’d think that strapping into an R-comp wrapped and track prepped Nissan GTR or tuned Porsche 911 would get my heart beating faster – but few cars have ever raised my beats per minute (human-speak for rpm) like the M5 has – particularly when at rest. I still fondly recall my trip to Seville, Spain, wherein I had the opportunity to thoroughly and definitively test BMW’s M5 monster. I flew in a week early to take in the sights, smells and tastes of Spain’s southern-most historical city. Having been occupied by Arab populations until they withdrew to Morocco in 1248, Seville (pronounced ‘Seh-Vee-Yaa’) is styled in Moroccan fashion, with unique architecture from wall to wall. 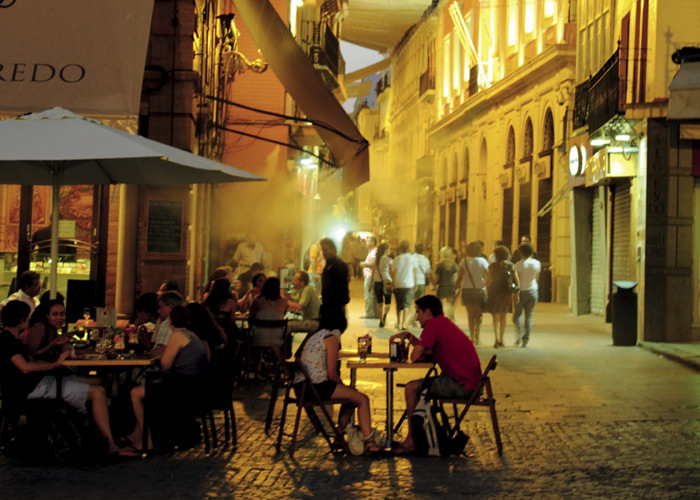 Being on the 37th parallel, Seville receives the hottest of summers, sizzling the sidewalks and any who dare stray from the shadows. For this reason, the Arab architects intelligently built the city accordingly, with very narrow streets framed by tall buildings. This construction method shields pedestrians from the pounding sun while walking about town. In a civil planning quagmire, the streets intersect at awkward angles and at odd distances, so you never quite know what direction you’re heading, lest you keep your mirror compass at your nose. Thankfully, the locals are quite friendly, and eager to help you find your way. In fact – hopping on a bus to the historical city, I was already a little lost in my maps. I noticed a couple whom appeared to be of local citizenship, and I stuck up conversation with them. They were very kind and offered me directions – then unexpectedly jumped off the bus with me at the recommended stop. They continued hopping buses with me, and guiding me until I found myself with them, walking down one of the aforementioned narrow alleyways, enclosed by tall, stucco-covered walls. My spidey sense was just about to ring alarm bells, “These people are way too friendly, perhaps they’re the serial killer sort?” when my impromptu guides suddenly stopped short and asked me to wait for a few minutes while the husband pulled out his keys and entered a housing complex. Two minutes later, a MINI Cooper S popped out of an underground garage exit, and the gentleman welcomed me to his car. “Let me see the address!” he said, as if he’d been planning this excursion all along. We pulled up to my hotel and my newfound sevillanos saw me off, welcoming me to his country and bestowing upon me his best wishes. It was only later that night that it really sunk in – a perfect stranger had treated me as if I were an old friend who had just arrived in town. This, is genuine Spanish hospitality. I went on to explore the marvels of this great city – its ominous cathedral, scraping the clouds, its party district where the night life happens (have I mentioned that Spanish women are particularly beautiful?) and its jagged Atlantic coastline; but no matter how interesting or beautiful my surroundings, my thoughts constantly migrated to the car I was about to experience. The countdown was on. As I walked the narrow streets, lined by tall curbs, I thought about the risk of curb-rash to any fine rims that attempt passage. Some streets started off narrow, but then narrowed even further in a bottle neck scenario – leaving any cars wider than a compact with severe curb rash or a long trip in reverse; I now understood the prudence of the MINI Cooper S driven by my local friend. Finally it was time to pack my bags and make my way to BMW’s global M5 launch event. I was introduced to many heavy hitters in the world of auto journalism – scholars including Chris Harris, Sam Mitani and Aaron Robinson were present for the event, and being in the company of such accomplished writers elevated the ambient energy. Dr. Friedrich Nietzsche, now head of BMW M, was also present, as were many top BMW designers, engineers and directors. For an aspiring journalist, sitting in such company is roughly equivalent to a 12-year old girl sitting down for dinner with Justin Bieber. I trust you understand the significance of this regrettable analogy. After a delectable dinner followed by cigars and brandy, I withdrew to my room, anxious for the day ahead. I must have set about six alarm clocks – not including the wake up call I requested from hotel staff. I was not going to sleep in. Finally, having traversed oceans and traveled for days, the moment I held so dear arrived: I was handed the key to a bright-blue brand-new M5. It was parked in a mess of other bright-blue M5s, but in some way this only added to the excitement – sort of like an automotive Easter Egg hunt. I performed the defacto remote key alarm chirping method to find the car, and eventually found her. As she sat silently in the Spanish sun, I knew I was about to experience something epic. But wait! Didn’t I already record my Spanish M5 excursions? Right you are – they can be read here, here and here (relating to my road test, race track review, and drift review, respectively). 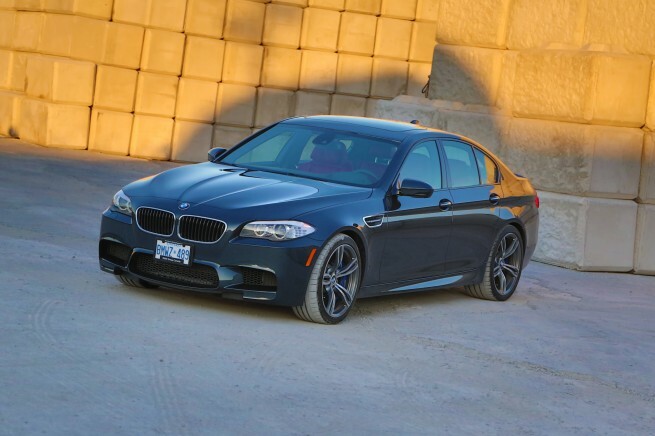 This Drive Review was performed on Canadian soil, with an M5 graciously provided by BMW Canada. I had absorbed the racetrack experience in full, having driven the M5 on the Ascari circuit, and at Laguna Seca raceway. I’d explored Spanish B-roads for hundreds of miles, but I hadn’t ‘lived with’ the car; hence the reason for this additional review. Many cars appear to perform well and possess exceptional qualities when driven at press events. Theorists theorize that automakers intentionally pick roads that favor their cars – or that they provide cars which are heavily modified for journalists, only to mislead them into excessive praise. In truth – few, if any, manufacturers have performed such trickery: the venue is typically planed around the journalists more than it is around the cars (think logistics to corral tens or sometimes hundreds of auto scribes to test drive in a foreign location – it’s somewhat akin to herding cats). Nevermind the rumored auto co. psyops – after driving several generations of BMWs far away from press events one thing is for certain: Bavarian cars are freight-train dependable, and bullet-train fast. Still, living with a car is very different than exploring an exotic location with one, so I was curious to see if any idiosyncrasies might surface after one full week behind the wheel. 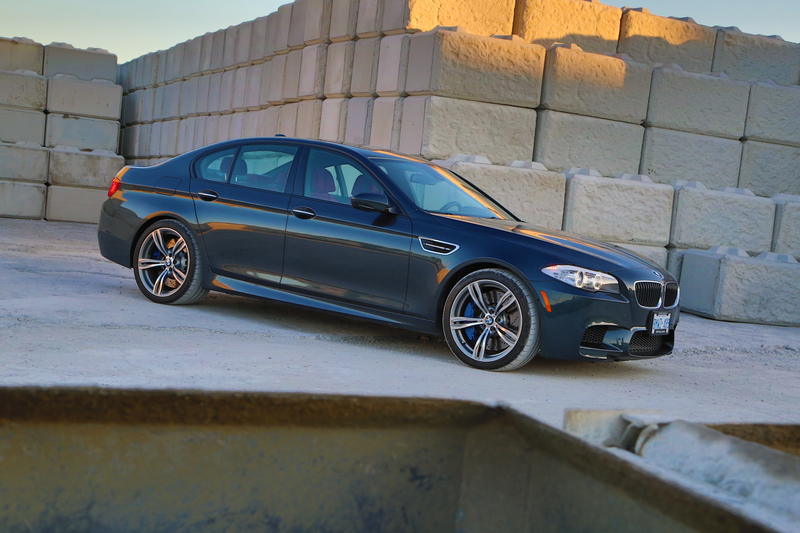 For the third time, I was handed the keys to BMW’s M5, and the novelty didn’t wear off. In fact, it seems the third time is the charm. 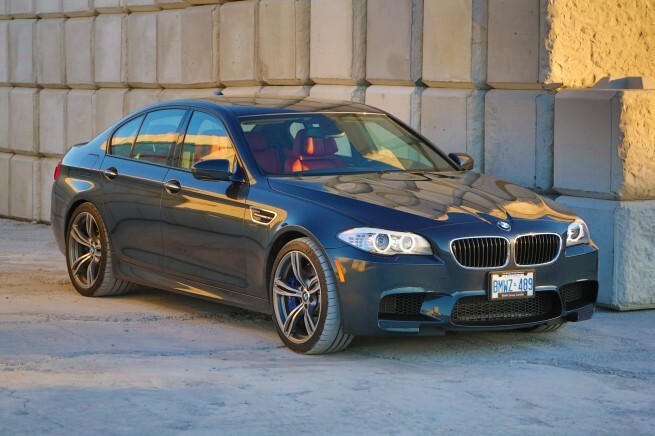 Let’s be clear about this: Toronto is no city for an M5. Of course, the M5 will serve you well in Toronto, but with what are reported to be Canada’s strictest traffic police and undoubtedly some of the roughest roads this side of the Rubicon Trail, you ought to keep your M5 at the speed limit. Frankly, given the rather conservative speed limits, a 535i can easily trounce your Toronto commute without breaking a sweat. 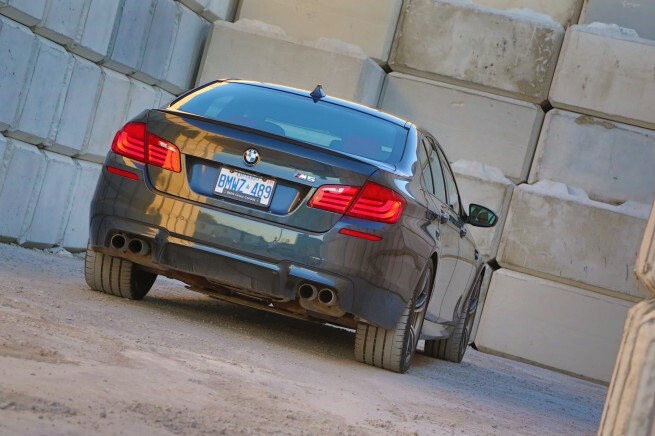 So, why bother owning an M5 in Ontario – or other similarly policed provinces or states? Because racetrack. Yes, that’s right, because racetrack. You likely live within a reasonable distance (in a Bahn-stormer no less) from the racetrack, and I positively bet-your-bottom-dollar, pinky-swear guarantee you that even one day a year on the racetrack is worth the upfront investment to own such a car. When you’re not hooning, drifting, and time attacking in the captain’s chair, the M5 will be chauffeuring you to work, gym, grocery store, and play. It will do this with class and poise beyond its calling card as a crazy man’s ride. Many cars on the market have “adjustable suspensions” – but BMW’s M5 displays such a wide window of divergence from taught to soft that it leaves you with the realization you have in fact bought two cars, not one. On the track, with a sufficiently hot foot, you’ll want to turn all the nannies off, set the steering to Sport or Sport + setting (depending upon your tastes: I for one, and several distinguished racers have voiced a preference for Sport over Sport + because the latter feels artificially heavy while not providing additional sensory feedback), the suspension to Sport + (unless the track surface is bumpy, in which case it may call for Sport), the engine/throttle response to Sport +, and your seat a bit closer to the wheel, with the wheel a bit closer to your chest. Conversely, on the road you’ll want roughly the opposite: all systems to their softer parameters and the 7-speed DCT in automatic (if you didn’t order the stick shift). This is how I spent most of my time during my week in Toronto. I even played with the fuel economy, attempting to hyper-mile the car into 30 mpg territory (this never worked out because no matter how hard I tried to resist, a deep blurp of the throttle was often beckoned, for the sound if not the G-force). For one solid week BMW’s M5 served as my loyal steed, warming my thoughts during a stressful day at work with day-dreams of lurid sideways drifts, putting a skip in my step across the parking lot, and quelling my nerves on the drive home. Don’t forget about your annual track day. Yes, the M5 makes for a lovely GT, but at its heart it’s a raving lunatic. It must be unleashed, for fear it goes crazy. Owning an M5 and not taking her to the track is no different than owning a stallion, a race-bred horse, and keeping it forever pent up. It needs to run and feel the wind through its mane as the M5 needs to open its valves and pump its pistons as hard as possible, with all its might. It needs to unleash the 550 horsepower held within. Are you considering an M5, or are you a current owner? After telling us about your ownership experience in the comment section, be sure to check out BMW Car Club of America’s website or BMW Club Canada’s website to sort out which track days you’ll be attending this year, and at which venues. You’ll find no finer performance driving instruction at any price point, and as a small digression, I’m confident you’ll increase your circle of friends among BMW’s official club ranks. Don’t forget the added bonus of a copy of Roundel Magazine or Contact Magazine mailed directly to your house – should you need a little Bavarian uplifting. While you’re piloting the M5 in a manor consistent with civil obedience, what types of adventures might befall you? Expect plenty of window-down fist pumps and thumbs up from fellow motorists. Expect pedestrians to gawk from the sidewalk, even when she’s dirty (especially when she’s dirty?). Expect to feel just a little bit more like The Transporter, knowing The Transporter would trade his 760iL (and most certainly his Audi S8) in favor of your legendary ride. Perhaps the most enjoyable time I spent with BMW’s M5 was from behind the lens, photographing this beauty as if an in-demand supermodel. I captured all of the images above and below (save for the one with the hooligan behind the wheel – Tom Kirkpatrick caught that one) and I couldn’t have found a more willing model. Her curves and bulging wheel wells danced sunlight across them in a way only an M car can. Giving the M5 back is always a bitter-sweet event. I double check the interior for belongings before handing in the keys – then I stammer out to the parking lot, lost and bewildered at my loss. I feel as if a widower, married 50 years and now sorely missing my companion. Time does not ease this sort of pain. I submit to you: the only way to overcome such M withdrawal is to buy an M car. I’ve been working overtime ever since. 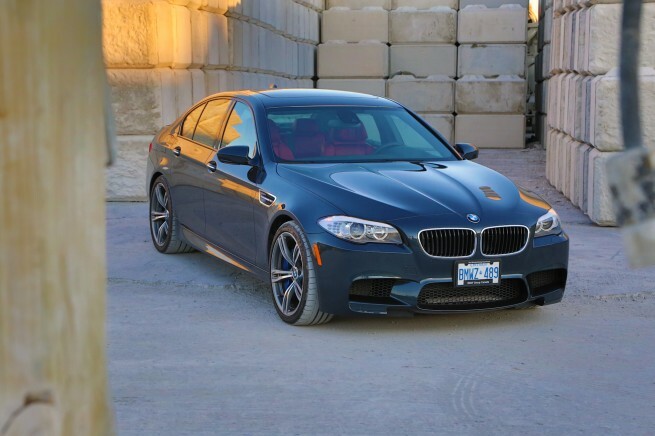 Special thanks to BMW Canada for our time with the BMW M5.